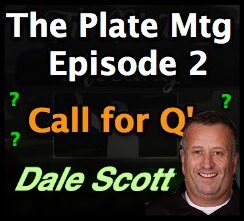 Tmac and I are excited to announce the second episode of The Plate Meeting podcast from CloseCallSports.com with our second guest, a 32-year MLB umpire, 16 as a crew chief, 3,897 regular season games, 3 World Series...It's Dale Scott! Dale Scott will answer your Q's on the show. Just like last time, we need your help with questions you'd like to ask Dale on the show (and not to worry, we'll get to the remaining questions for Bob Davidson that didn't get answered in Episode 1 on a future Plate Meeting). 2) Call the CCS voicemail line at (507) 400-UEFL [aka 507-400-8335] and leave a message. As we did with Episode 1, we'll leave this thread open for about a week and record our episode shortly thereafter. And if you haven't yet listened to episode one (and, if so, where've you been? ), see the following link to hear our interview with Bob Davidson. Related Post: Plate Meeting Podcast Episode 1 - Bob Davidson (7/17/18). As for Episode 2, Dale has a message for all of you! Related Audio: Dale Scott Podcast Teaser (embedded below; click the image/video to play). The Plate Meeting, a Left Field Umpire Podcast is CCS's official audio show where we talk umpiring with umpires, and discuss officiating related issues, including analysis or other conversation pertaining to plays, ejections, rules, and more. To subscribe to The Plate Meeting, visit our Anchor.fm page, which offers external links to popular podcast providers, such as Apple Podcasts/iTunes, Spotify, Radio Public, and, coming soon, Google Podcasts. Be sure to follow us on Twitter 🐦 (@UmpireEjections) and like on Facebook 👍 (/UmpireEjections).